South Florida got its first look this week at the latest TV show to film in the area. "Bloodline" will stream on Netflix, home of prestige series like "House of Cards" and "Orange is the New Black." It's set in Islamorada and is described on the Netflix site as "a dramatic thriller that explores the demons lurking beneath the surface of a contemporary American family." 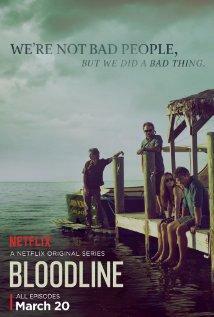 "Bloodline" was filmed in and is set in the Florida Keys. It starts streaming on Netflix March 20. "I am so excited" said Rita Troxel, film commissioner for the Monroe County Tourist Development Council. " When I see the trailer, I just get goosebumps,"
Troxel said the show should be top-notch. The producers are Todd A. Kessler, Daniel Zelman and Glenn Kessler, known as KZK — the same team behind the series "Damages." The show's cast includes Kyle Chandler of "Friday Night Lights" fame, Sissy Spacek and Sam Shepard, among others. And Troxel said the production brings money to the Keys, both in direct spending and exposure as a location. She hopes both tourists and filmmakers will see the area's advantages, starting with the water and the long hours of sunlight. "And then there's the proximity to a very large crew base in South Florida, so you don't have to get this incredible color of water and palm trees by leaving the United States," Troxel said. "You can stay here and drive your grip truck on down." "Bloodline" will be available via streaming on Netflix March 20. The first reviews look promising. The Hollywood Reporter reviewed the first two episodes, which were screened at the Berlin Film Festival, and called it a "riveting, superbly cast slow-burn family drama." While the Florida Keys may provide a fertile setting for crime fiction by the likes of Carl Hiaasen and James W. Hall, in reality the islands are getting safer, according to statistics from local law enforcement agencies.